Counter started: August 22, 2006. Hey, hey buddy, read everything I write, walls of text or no. My words explain a lot and might actually be funny once in a while. 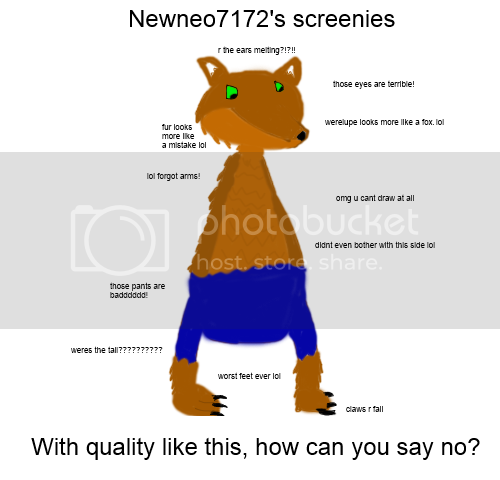 Unfortunately, you've appeared to have found my screenie page. Have a shortcut to sections, because I'm the master of taking up space. Page Two, because I'm that wordy. I apologize if any of the screencaps here are way too big or too small. I probably could, like, resave them and change them around, but that requires way more effort than I'm willing to expend. Also, I apologize for any lack of quality in the content. These have been made over the course of, like, seven or eight years, starting since I was about nine, so expect a lot of "Cheese Monkey Random Time!" nonsense. 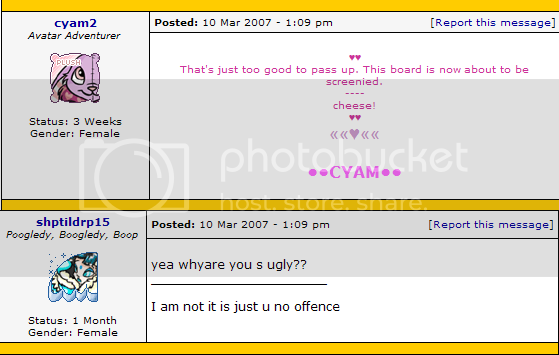 As such, the comments I put underneath the screenshots are pretty self-deprecating. Because that's clearly funnier. BAM! Year long hiatus! What is UUUUUUP? Yeah, a bunch of stuff has happened in a year but none of you care about that and frankly I don't feel like writing about it. What do you guys think you are, my therapist? So, updates? Well, I messed around with the code; apparently last year I hated the background color (dark teal and brown-green? Ew) and that hasn't changed, so now it's more of a contrast. 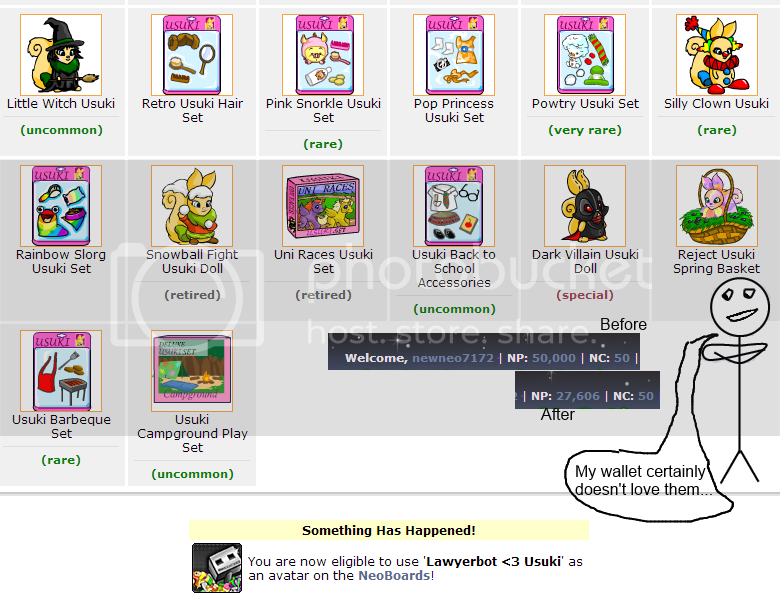 I think I had some screenies queued up but, something-something, new laptop, something-something lost all my pictures. 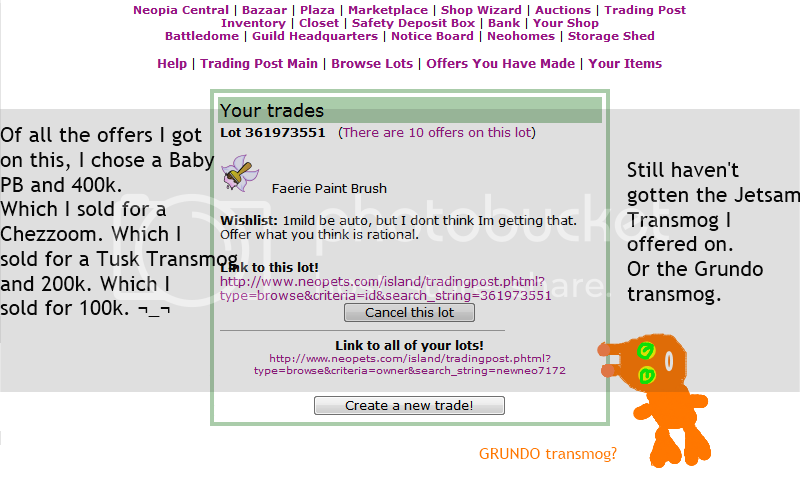 Didn't even crash this time, just was awful at transferring. I'm the worst Comp-e major ever. So, really, yeah. I messed with code. 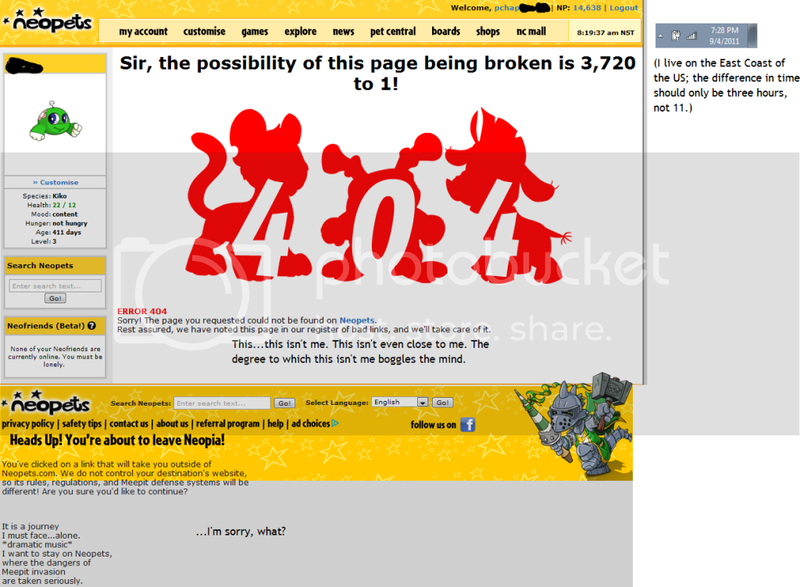 I also fixed the page 2 code and gave the reviews page a new look, since just opening that page hurt my eyes. 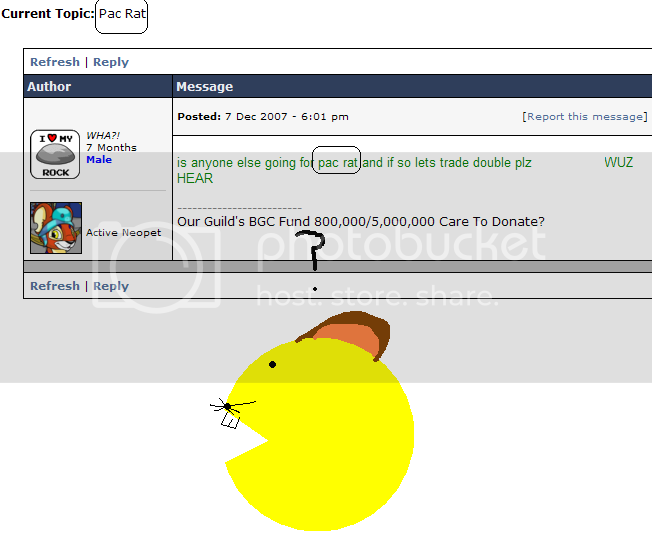 That was some vintage 2007 graphics design there, and yet I think that wasn't even more than 4 years old. On an unrelated note, I'm so old, I'm yelling at the darn kids' great grandkids to get off my lawn at this point. Now everything but Mistorywoman's page has a somewhat consistent look, but that's fine, since hers is somehow even more text-heavy than my screenie pages. Oh,also, I had to make changes no one will notice. Basically, since the last time I was on here, the filter got way more strict and certain words I use all the time contain letters that, when isolated, make far less appropriate words. 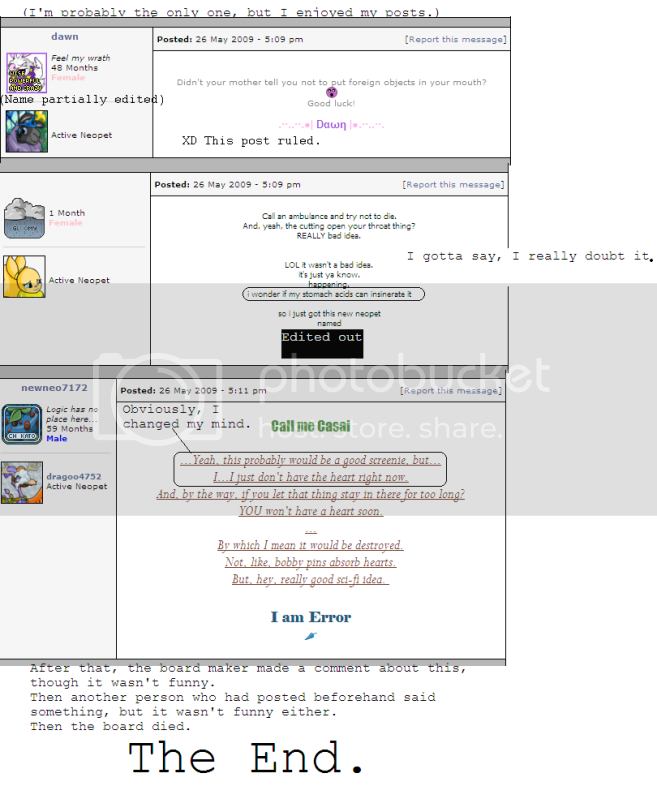 Long story short, some screenies had to be reuploaded with new names and some sentences may make slightly less sense because they used to contain blocked words. Now that these changes have been made, I look forward to having another 3-to-18 month long hiatus. Unless I get bored at college again. Holy Kau, that's what, a 7 month hiatus? Six and two weeks? Whatever it is, it's long. And I don't have much to show for it. So, in the time I took my break, I took classes in stuff, I did nothing for several months and now I'm back for probably another few minutes. Or something. Basically, I'm doing this to avoid watching videos that teach me about calculus because I'm too lazy to do something that I'm very much gonna need if I'm going to be an engineer, like I signed up to do for college in the fall. Yeah, I'm purdy old. Compared to a forth grader, at least, I guess. Anyway, you guys don't care about that, so I'll tell you about stuff you also don't care about: what I did to merit making this update exist! Nothing, basically. I keep seeing my layout and wanting to change it (at least change the color), but I haven't. I may eventually. I just changed some comments to things that seemed funnier. 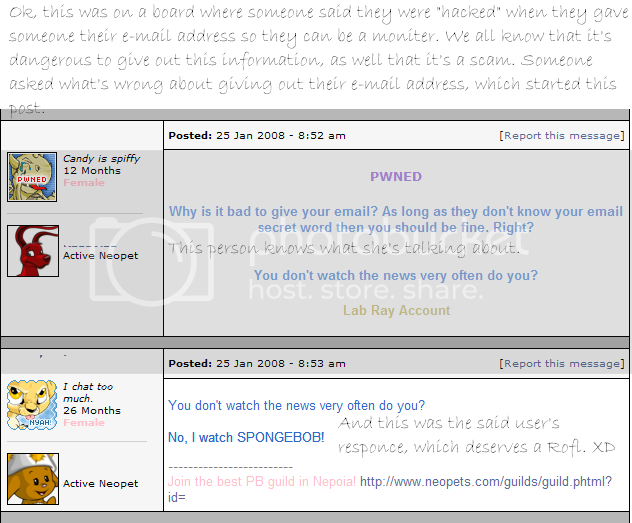 I completely redid one hatemail screenie to actually talk about what made it exist and, well, why that screenie is like the worst thing ever. What I'm saying is, I made an even bigger wall of text than the one you're currently reading. Wahoo! Oh, and I made a lab screenie that barely even counts as a lab screenie. You'll see when you see it. It's on gfrupl's page. Last picture. ALLLL the way to the bottom. If you are that horribly bored, the rest of the updates I've had (starting with when I decided to keep track of them) and their logs are here. Mostly, this section is just a mix of screenshots that wouldn't go anywhere else and just really silly junk. They're not my best; in fact, the majority of them are really bad. Of course, though, it's one of my most updated sections (I guess because it's so broad), so not only do we start with garbage, we start with multiplicities of garbage. Rejoice! So, for the longest time I have never had a comment for this picture. Looking at it again, I think I can see why. I'll try something anyway. So, this was the beginning of me trying to actually draw half-way decently, a quest I've somewhat given up on since then(see: the fact that I now depict myself as a stick figure). 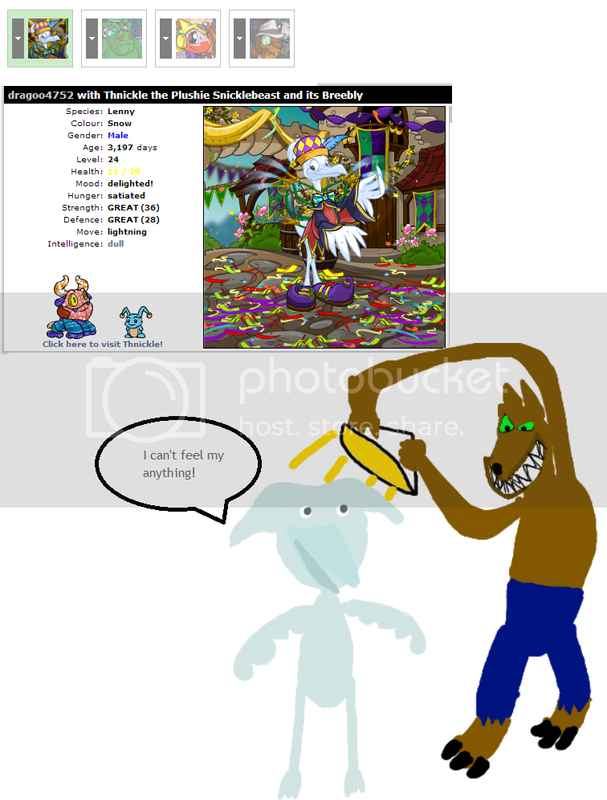 I was actually super-proud of the picture at the time (so much so that I saved it as "Go Breebly good drawings too" o.o), though, looking at it now, that atrocity of a petpet makes me cringe. Also, what the Moltara was I thinking with the writing? I'm nonexistent (despite being talkative as all get-out), you can barely tell who's saying what, and it's not even close to funny. Man, I'm the best at this. I know it's partially also the fault of the original design, but I think some specific notes on my drawing of that petpet are in order: 1) He has some pretty rad bull horns. 2) He appears to have reverse chickenpox. A bull with antipox. 3) By my count, he has 8 legs; he has four legs facing us (don't tell me two of them are the other side; they look identical to the ones close to us) and presumably four legs on the other side. So he's like a spider. And a bull. 4) I think he took part of Mistorywoman's dress. 5) HE HAS BUCK TEETH LOL. What I'm saying here is this clothes-stealing bucktoothed spiderbull with antipox is slorging weird. Huh, so we've gone from no comment to a wall of text. Not sure if that's an improvement. Then go for the longest time thinking that his thoughts were true. Yeah, I hate this pic. I feel like I thought it was hilarious when I was twelve, but, you know, it clearly isn't. 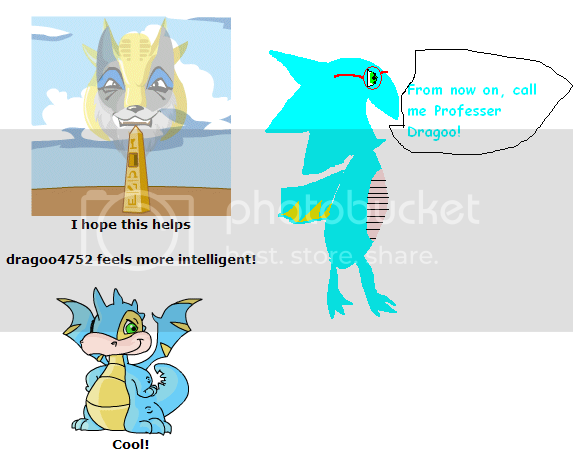 Dragoo knows what it feels like to be smart. Huh. Also, fun fact: I totally misspelled the word "professor" in both the image AND the image name! I saved it as "ProfesseDragoo". Man, I'm earnin' those "A"s in English! Also, SWEET SASSAFRAS COMIC SANS WHY. Alright, story time. 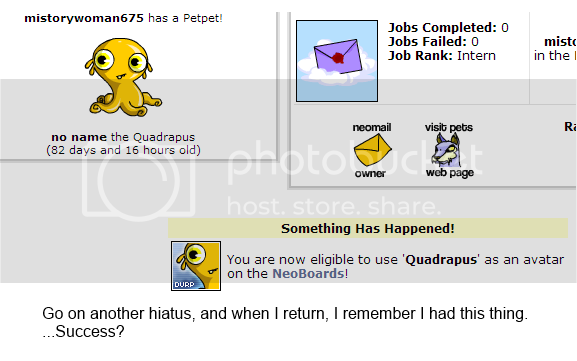 Alltipe (the guy causing great deals of harm to Illusin with my shoyru) was the mascot of my screenie page at one time, but I've kind of retired him. He was a character I made up when I was younger and wanted to write books about him. He's also terrible and I hate him. I mostly just use him in my fanmail having him fight (occasionally requested) nonsense anymore, as otherwise I'm tired of the guy. Just never funny and lacking any reason to exist. Also, SWEET SANCTIMONIOUS SALAMANDERS, I USED PAPYRUS. I CANNOT FEEL MY EYES. I...I'm not sure whether I like or hate this screenie. The drawing of me with fairy wings is kind of funny, but you can tell I stopped caring at about Troy (which is too bad, because that drawing of Dragoo looks really good for my lack of talent). Mistorywoman looks tiny and actually kind of out of place for some reason. Gfrupl looks like his goggles melted, his arms turned into a delicious sorbet, and that an elephant trunk is growing out of his parietal lobe. That last one wasn't a condemnation, by the way. That's pretty awesome. 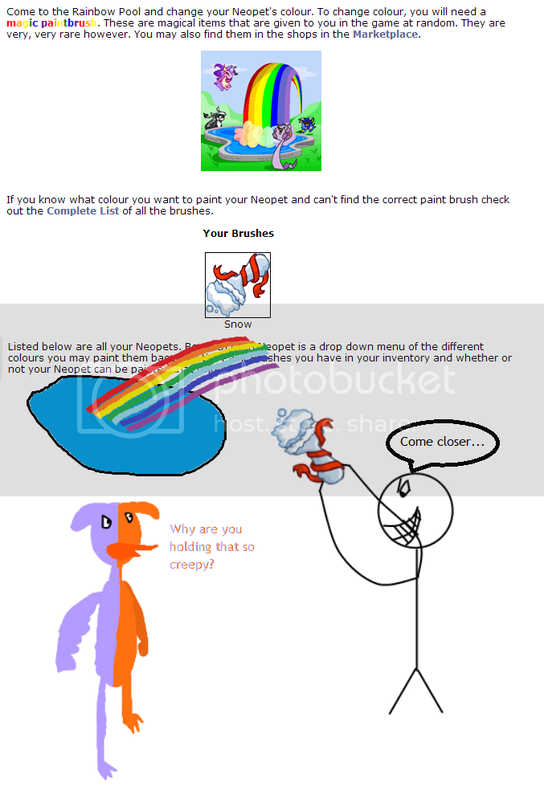 And now, the not-at-all awaited sequel to the Faerie Paint Brush Story! Dang it, interrupted by a stupid, unnecessary series. So, I made these, like, the day of getting the Faerie Paint Brush, but I felt like framing it as if this was a long time in the making, because of course I would. So here, in their decreasing-in-art-quality glory, are the four screenies I took based on the Transmog thing. So, I said "decreasing" in quality, but I'd say this is the second-worse drawing of Gfrupl I have here (not counting him as a mutant, which is also terrible), the worst I have being the second-to-last one, where I stopped caring entirely. On the plus side, that is one sweet, sweet stick figure. Look how happy he is! Am I the only one who thinks Gfrupl looks like a beetle here? No? Nobody? You're wrong. He looks like a beetle. Ok, I'm starting to regret the comment where this is the worst. The lack of color and detail is ridiculous, but it otherwise actually looks pretty rad. It's cleaner, for sure. What I'm also regretting is the placement of text. 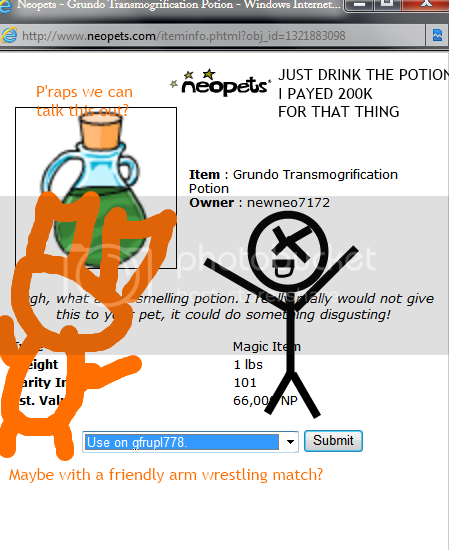 The arm wrestling comment (which, by the way, I don't know why I wrote) was supposed to be BEFORE my raging. Man, for a series, I'm breaking up the parts a lot. I like this screenie. I don't know why, but I like this screenie. It's kind of stupid, but I think the translated text was kind of funny, as well as the fact that I decided a translation to rage words was a good idea (it was. It totally, totally was.). So, that's that. He's a mutant. I'm still looking for either a transmog or morphing potion for Dragoo (it has to be Jetsam--that's the only thing I want right now.) Man, the fact that Dragoo was originally a Scorchio (and therefore slightly more dragon-like, considering "Dragoo" was a typo of "dragoon") and is now a lenny (I got the potion from some AAA event, I think) makes me laugh for some reason. ...Did I just say laugh? I meant sigh. I'm very good at sighing. I do it way too often in these comments. Maybe she got a new haircut? Oh, mercy! What on earth happened to this poor drawing's head? I...shouldn't somebody get him some help? Anyone? I don't think it's supposed to melt like that! So, I originally here had a joke about giving away where I lived, but I basically didn't in this screenie and it wasn't funny. So, instead let's be not funny in a different way. I have no idea why I felt like making this screenie. 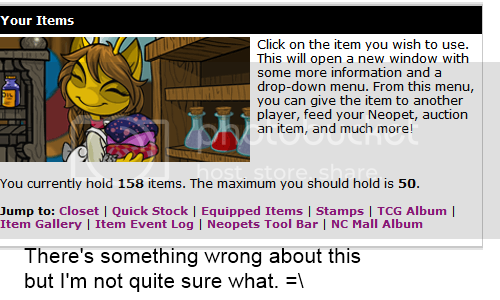 Yes, it's a weird glitch (one that I, admittedly, still have no clue why it happened). But pointing out how something is weird does not a joke make. Instead, let's point out how this picture could just as easily have been faked and I was just being as lame as possible. Actually, let's not. Let's just point out how Kikos always look like they really want to punch you in the face. 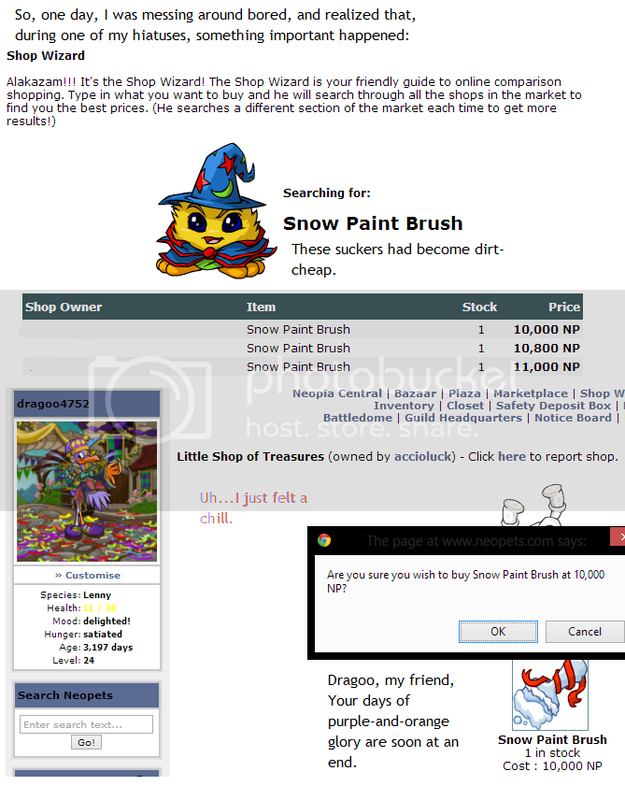 Welcome to the beginning of the snow paint brush...saga? I dunno. This is probably the worst of them, if only because it's neither funny nor full of lame drawings, where the rest of them can at least say the second part about themselves. I hope you guys can read Dragoo's text, since I took way too dang long making it look like that, forgetting nobody would really, you know, care. Aaand here's the worst-drawn of them. Look at that weird not-perspective! How Dragoo looks both flat and 3D at the same time, whereas my stick legs just look terrible! Honestly, I think I got better as it went along. That said, I really like my face in this, as well as the rainbow. Actually, the rainbow marks about the point where I figured I'd try to make this little series not awful. Basically, I thought "Eh, I'm actually doing something here and it's looking at least tolerable, so I may as well try to make it all look good." Did I succeed? Read on and decide for yourself. I don't care that Troy looks like a deranged Scooby-Doo. I don't care that Dragoo looks like Big Bird was covered in flour. I don't care I clearly gave up at the feet. I don't care the perspective on this is all wrong. I don't care that Troy's arm is stretching so much, he'd put Mr. Fantastic to shame. I don't care that he also looks like he's doing a stupid dance. 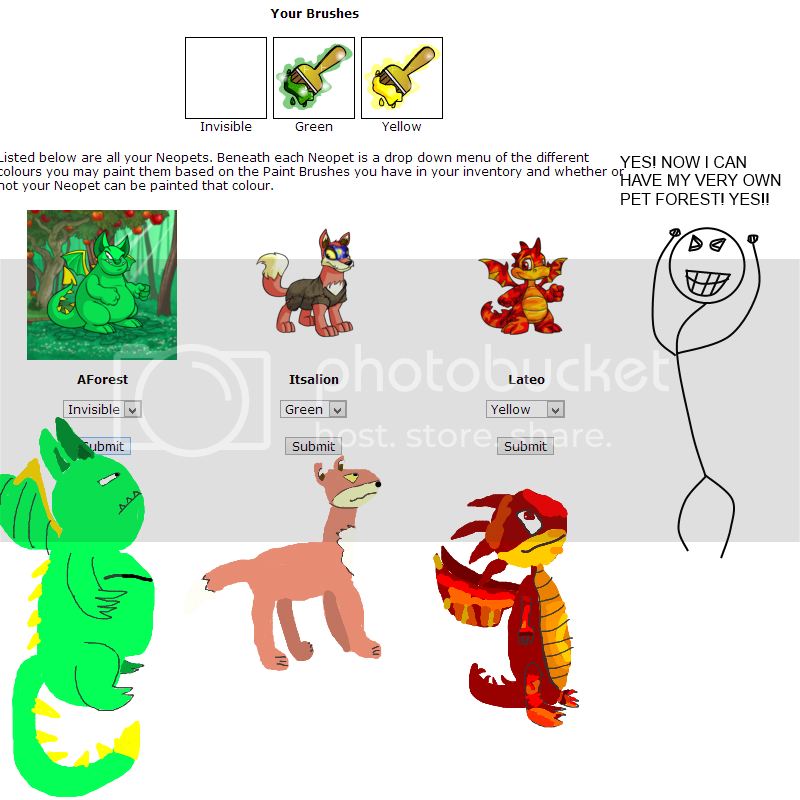 I don't care Dragoo's line is stupid and unfunny. I don't even care that I forgot to color in the back of the lamp. All I care about is the purdy pictures. I love the look on Gfrupl's face. He's so darn happy. When I'm feeling down, I use his tiny smile there to make me feel better. If there's anything about this picture I don't like, it's Mistorywoman. I've never been able to figure out a good way to draw her, let alone from the back like that. I think she either looks like an old lady or a shy little girl, depending on how I'm feeling that day. I, of course, was supposed to be, like, wrapped around the avatar, but that apparently required way more talent than I have or something, so instead I look like I'm sitting on the wall, as I euphorically push the picture away. Seriously, if I looked any happier there, I'd think we'd need to call a doctor. I dunno. I'm still really happy with this series. For once, my art looks at least kind of palatable, and certainly better than I'm used to for my own work. It's still not as good as, well, most other people's artwork, but I'm still happy with myself and hope I can keep this up. For very obvious reasons, I've never considered myself an artist, but, considering how bad my art can get, I'm still happy with it. Now, if only I'd actually come up with funny things to say, both in-picture and captioned, then this could almost be considered a "good" screenshot. But, alas, such a thing is not happening here. 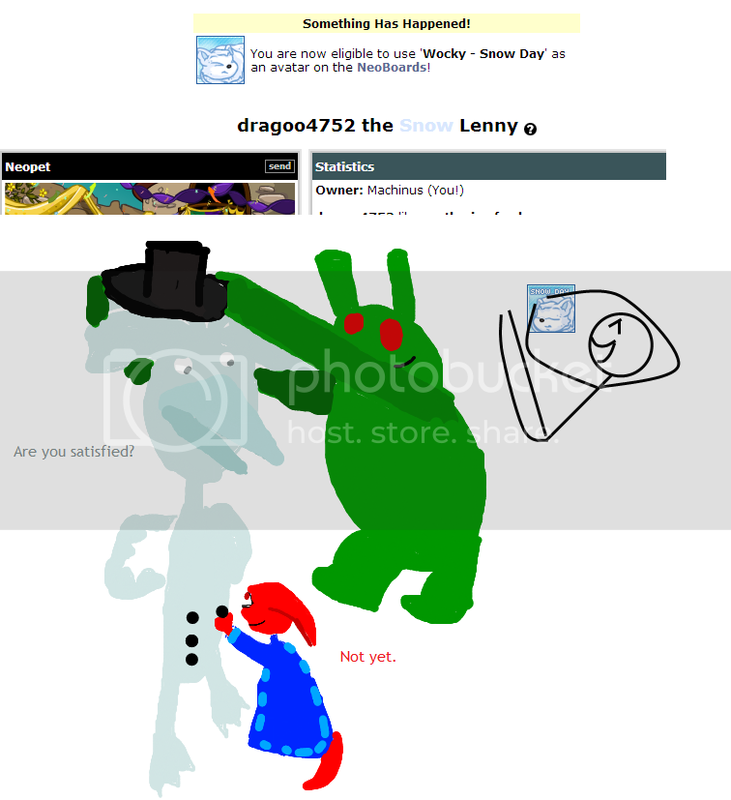 Also, have a little completely uninteresting behind-the-scenes: Dragoo's "Are you satisfied?" (which, come to think, is way too big of a word, considering the personality I try to give Dragoo) was initially directed at me, with my response to be the equally-unfunny "Quite." 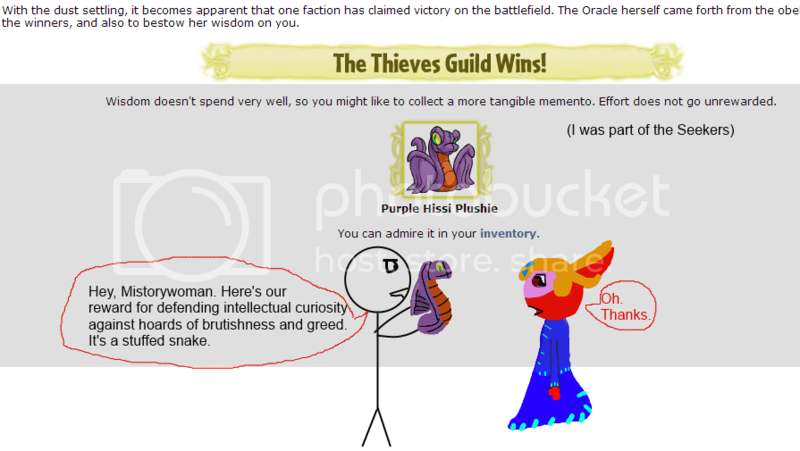 I then decided Gfrupl and Mistorywoman were more interesting to look at, so they get the attention. That said, the look in Mistorywoman's eye there makes me feel a little...uneasy about her "Not yet." I think the less thought about that, the better. 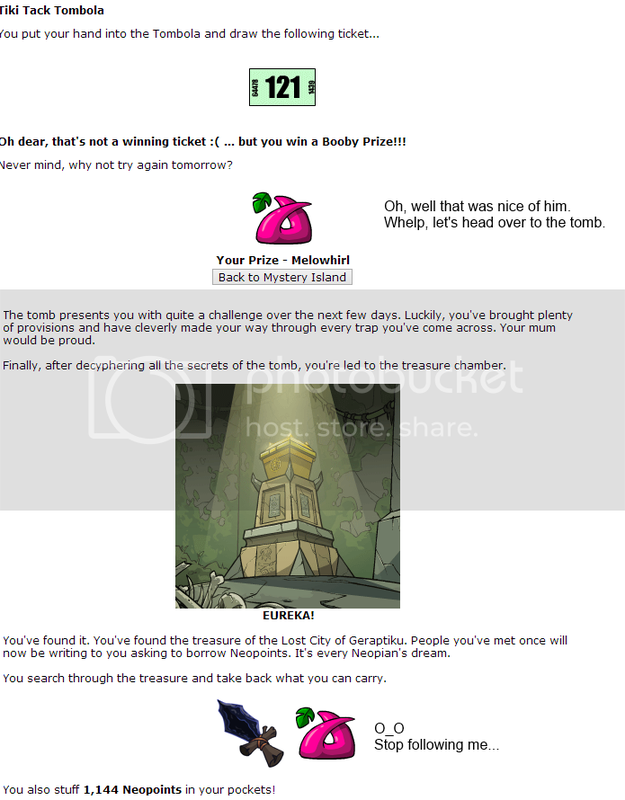 Holy mother of Fyora, that was a massive wall of text. I'm so boring. I swear, man, I'm always looking over my shoulder. One of these days, a Melowhirl is going to appear behind me with a knife. If you never hear from me again, you'll know what happened. I'm not entirely sure what's going on in this picture. 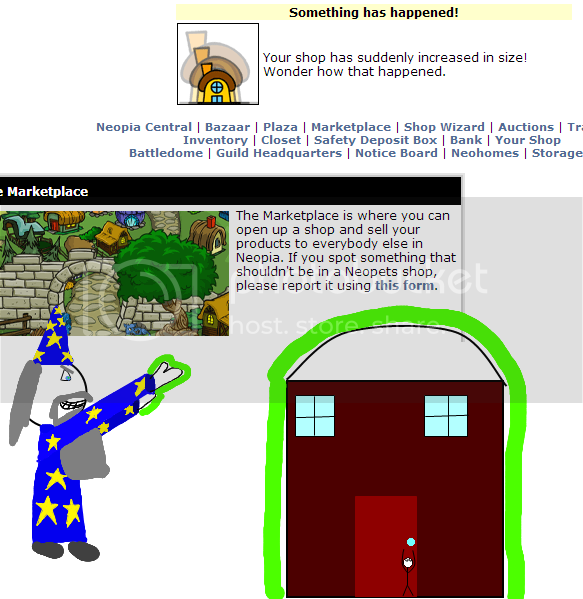 I think a Godzilla-sized wizard covered his hands in the Nickelodeon slime and made my shop grow, with the adverse effect of also irradiating it. Those are some sweet-lookin' pajamas he's got on, though. Wanna know what's funny? Other than not me? The last description I had for this was all about how much I don't know how I feel about this pic. 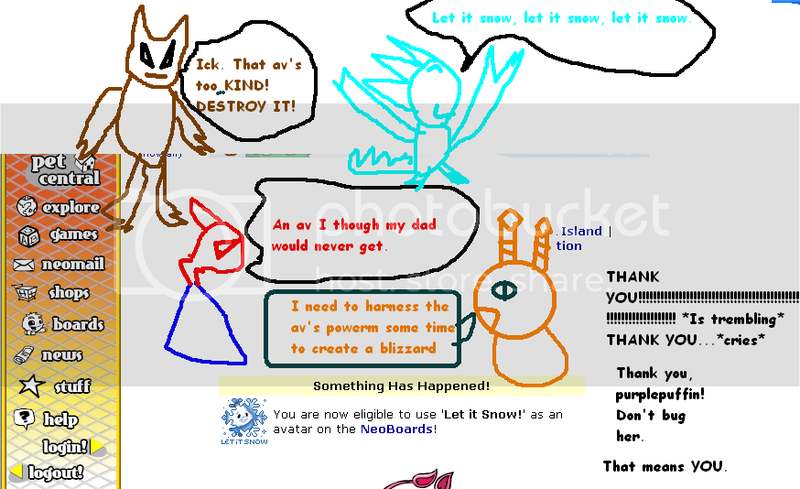 To be fair, the art's a little lackluster and I messed up on some bits and the text boxes are painfully bad. That's not the funny part, though. The funny part is, despite it being pretty flawed and generally kind of lame, I still mentally consider this one of my best screenies, at least of my new ones. I couldn't tell you why. At all. Maybe it's just that it actually has a joke. Well, sort of. I think it's just that, considering its issues, it's pretty much the best example of my work. Either way, I'm pretty happy with it. Well, all but one thing. My eyebrow. You could land a 747 on that thing. I apparently need to groom. This miniseries was made entirely because I wanted to show off a terrible joke I thought of. You probably already guessed it. Oh my good golly gosh, what is wrong with my eyes? So, let's see here. I hate that picture I did of Lateo, I hate that picture of Itsalion (...I really named him that, didn't I? 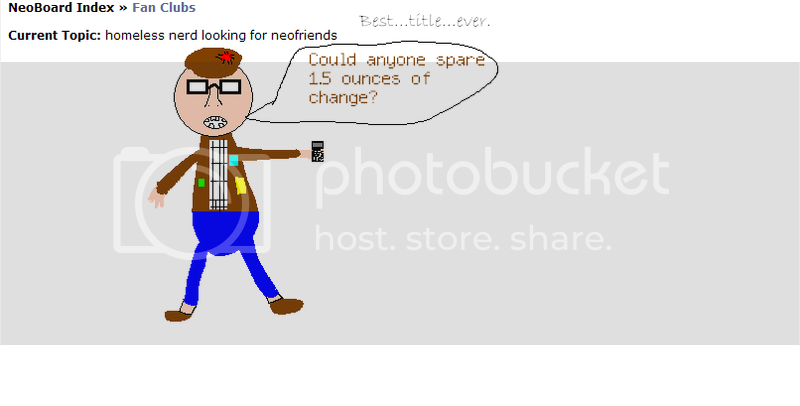 ), and I hate that picture of AForest, no matter how fun it was to make. 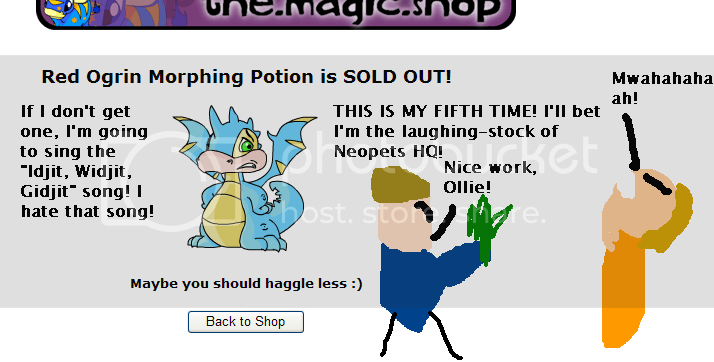 Yeah, I think I just have fun drawing big burly Neopets. Interpret that as you will. 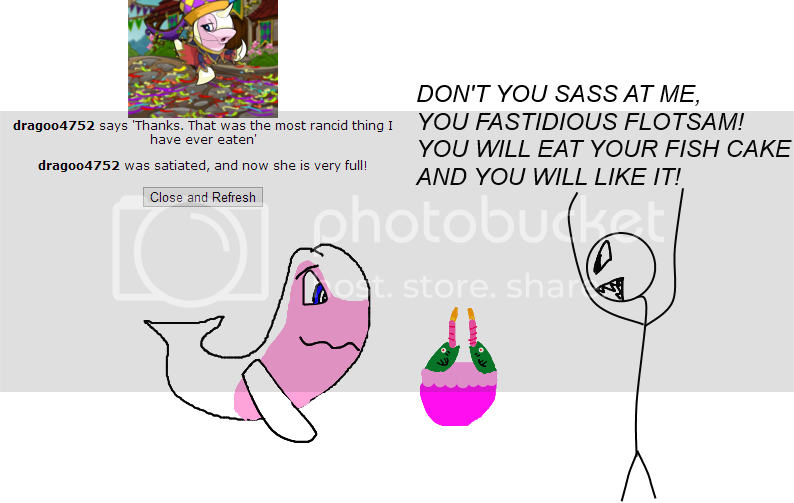 I suppose I'm being a tad harsh on Lateo's picture. It's not his fault he lost at a game of paintball. You see this joke? 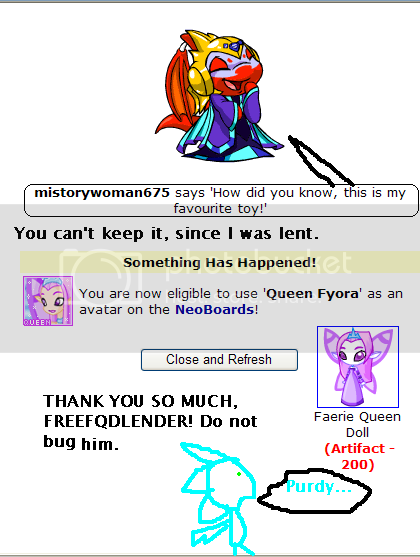 This is the kind of nonsense I made this pet for. That, and the idea of having a pet forest was funny in my head. Of course, I think this idea came to me when I was bored in Math class after a sleepless night, so I think the idea of a rock would have been hilarious at the time too. I have no clue what you guys are talking about. 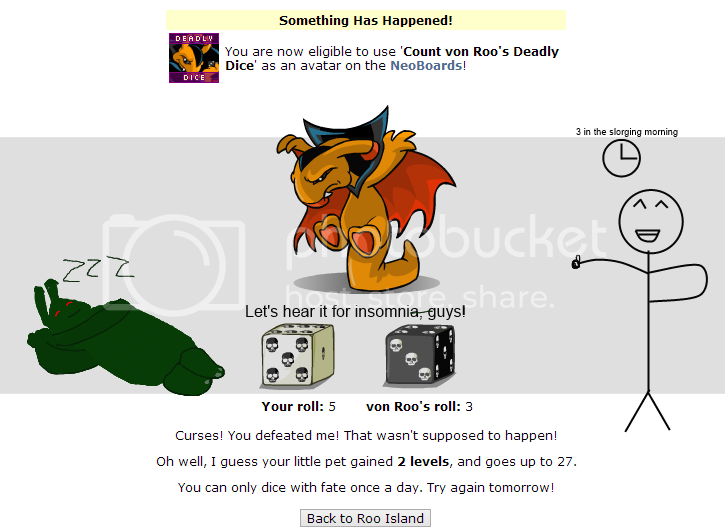 That Jetsam's name is clearly Rose, I have always had her, I didn't find her in the pound years ago and then transfer her to my new side, and I totally didn't pound Itsalion to still have a free slot afterward. That's just crazy talk. On the off-chance (read: never) I have a need to draw AForest, that's basically how I'll represent her. 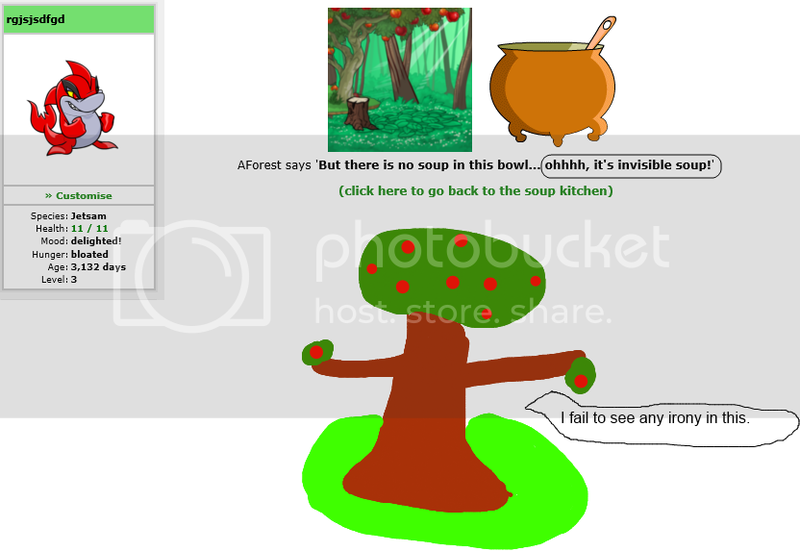 If both AForest and the soup are invisible, should they be able to see each other? Or does it not work that way? Invisibility is weird. ...I'm sorry, I don't know what came over me. So, at the time of writing, I made this picture like two months ago. So I have no idea what any of this is about. Or why it exists. Or anything. I think I made this for the express purpose of proving that, just because it's new, doesn't mean it's actually any good. I'm honestly too confused to even think about it. Woah, a joke! That's new! Five stars. I don't know what to think about this screenie. It's slightly funny by comparison, I guess. I actually drew Dragoo slightly better than usual. Slightly. Also by comparison. I look like I'm very desperately trying to strangle the air, though. Although this does have the same issue as a lot of my work, which is saying something in about twice as many words as I need to. Or, in brief, my drawings are lame my writing is long and I'm a loser for making it. 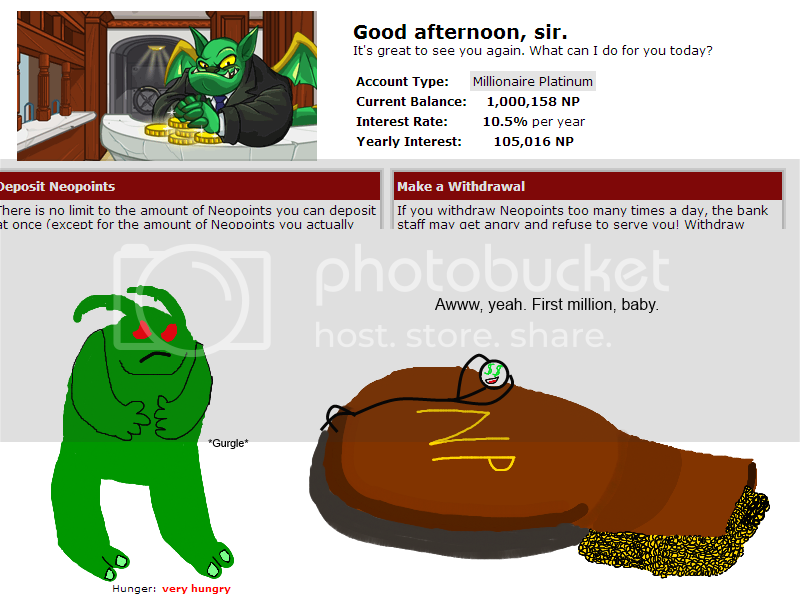 Who cares about my pets being hungry or the fact my sack o' cash was really lazily drawn? I'M RICH! Seriously, I'm not totally sure what's going on with the shading on that bag; I was trying to make the bag itself look larger and more stuffed than it turned out, and instead the shadow just looks bad. When I was planning this screenie (yeah, I have like five or ten minute mental planning and brainstorming sessions before drawing each picture; if I can't think of something to do with it in that time, I scrap it entirely. 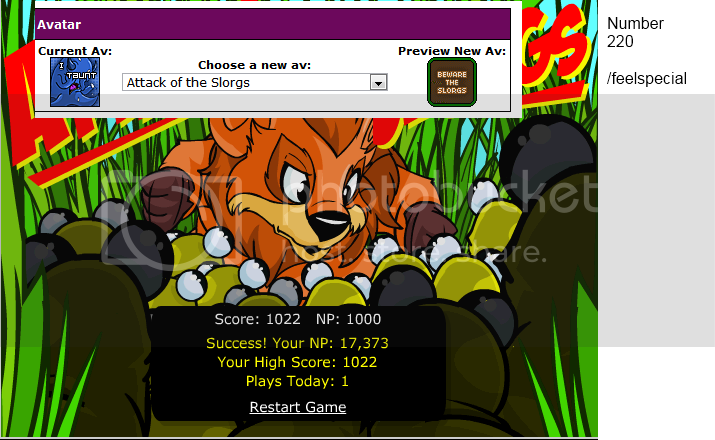 NERD), I thought about having me relax on just a pile of NP. Because I thought I couldn't make that work, I just went with a bag; when I thought there was too much blank space, I added some money spilling out. In retrospect, I could have easily done that pile all along. Oh, and, yeah, blah blah blah, drawing Gfrupl is fun, blah blah blah, those antennae look terrible. Now, there was a time that this was my most updated section, and the description reflected that. That kinda doesn't apply now. There may be the occasional update, but, for the most part, I'm not on the boards that often. For whatever it's worth, they're like never funny, so you're not losing too much from that. If you move back a bit, tilt your head slightly and squint hard, this screenie might be funny. Ah, humble beginnings. See this? First screenie I ever made, age 10. Story time: My brother showed me how to make screenshots, at least in terms of "just hit that Print-screen button and paste it into Paint!" and helped me scribble in stuff. I don't know why we decided to screencap that particular post, nor do I know why we thought Tingle would have been funny, but so it goes. The sad part? This is an improved version of it. 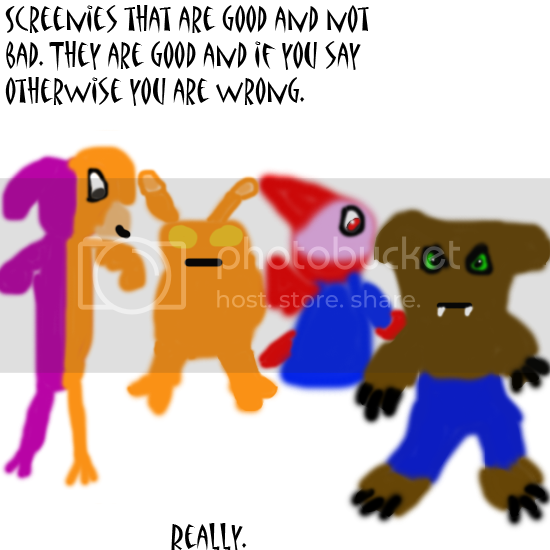 The original was the size of our computer screen (I was too dumb to know how to crop then) and I later put in the text; initially, I just used my mouse to write in words with the paint brush, which is multiple levels of stupid (of course, a tablet would probably be worse with my handwriting). I think we thought this was laugh-out-loud funny when we first made it. I almost wish that computer's hard drive hadn't crashed, since I kind of want to see my early work, if only to study the way my mind apparently worked eight years ago. Also, for those who are wondering, the scribbled text on the side there says "Tingle from LoZ", with the "T" apparently having started life as a "Z", looking at the way it's written. I for a long time had no clue what it said either, but apparently something in me went crazy and now I read it fine. This might just be the worst screenie ever made. Like, there should be a whole case study based around this screenie, trying to understand everything that is wrong about it. You could write a whole slorging paper based solely around why nothing in this screenie works and ends up causing me rage and probably giving the reader seven years of bad luck. And another milestone: The time I learned how to use more than one shot in a single image. Or, in less stupid terms, how to crop multiple pictures and make it one, long picture. The problem, of course, is I left this massive space between each shot, apparently thinking that looked more real than one fluid picture (which I suppose I can manage now). 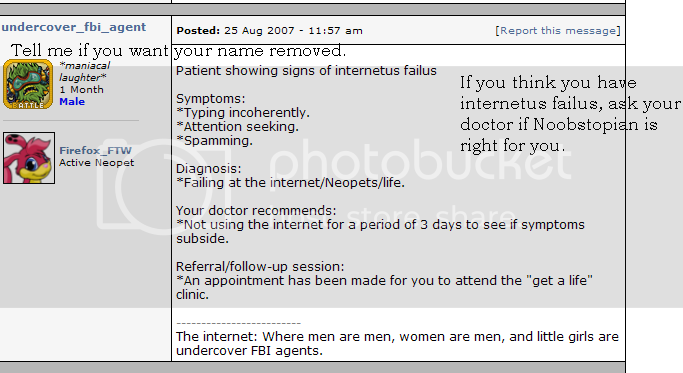 And, you know, I still kept in the Internet Explorer window (it's not my fault! 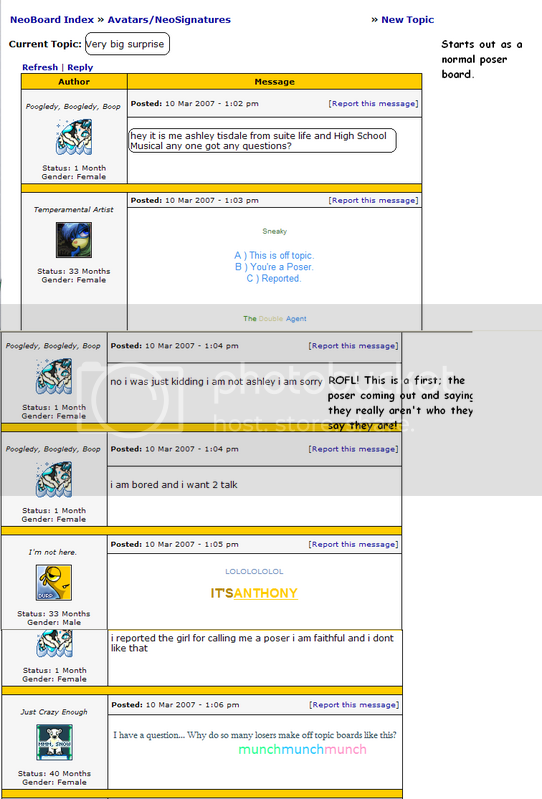 I was a stupid kid and it was 2006! I swear, I use Chrome now!) 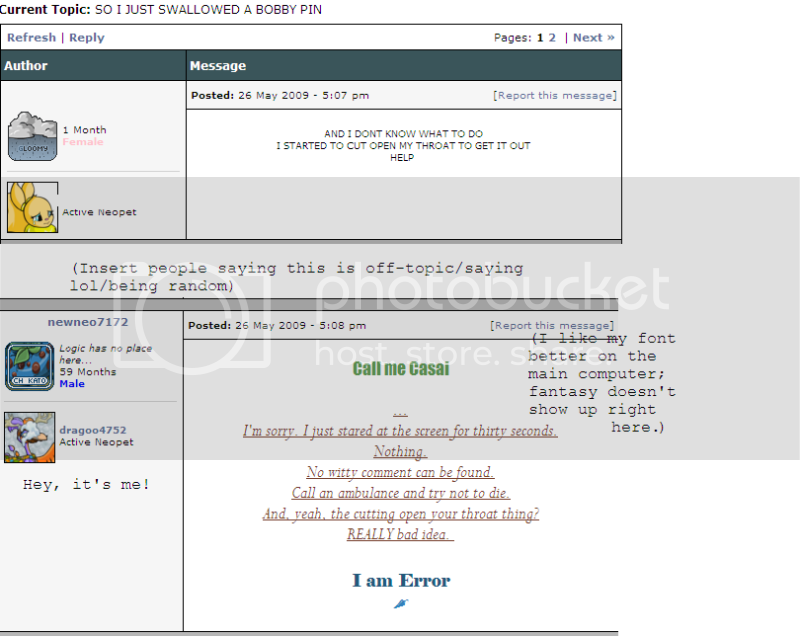 and the old sidebar. I'm also not sure if I meant to not put a single comment in the whole thing or if I forgot to do that, amid all the "hard work" I had to crop it. Or, heck, if adding comments were the original intent for having those big spaces and I, again, just forgot. Not that that means anything, though, since it probably wouldn't have made the pic any less unfunny. I'm sure there's a really good reason why I'm wearing the FQD av. Perhaps I decided to go against the idea of gender stereotyping. Perhaps I wanted to flaunt my radness by using an avatar that's arbitrarily considered "good", because it's an expensive item. Perhaps I was being ironic about it, considering I'm also using Comic Sans as my text and I refused to believe that I would ever use Comic Sans for any reason that isn't irony. Perhaps I thought I was a pretty, pretty princess. Okay, not gonna lie; this drawing is bad. I like the wings and that's about it. Those legs! What on earth happened to those legs?! And that stomach! He looks like an insect! 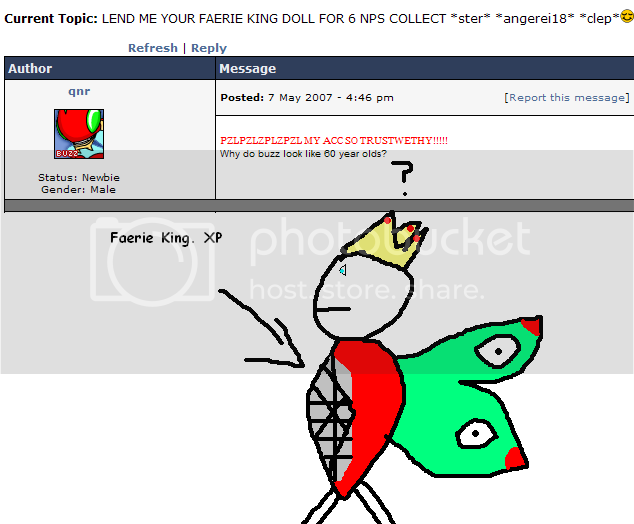 He is Faerie, King of the Beetles! Jokes I thought were funny at age 14, part one. Hooray, the first image so far I can safely say is kind of, sort of funny! YES! So, this was made on my side that I'm pretty sure doesn't exist now, when my main was suspended for having too much swag. Or something. I can't remember, it was a while ago. Also, my siggie there was from RENT. Interesting choice, I suppose. ...I was going to draw an entire map with ghosts and Pac-Pellets and everything, but then I decided that that would be far too much work. Alternatively, I'm lying through my teeth when I say what I was planning on doing for this screenie and I just needed an excuse on why this picture is so boring. Possibly. 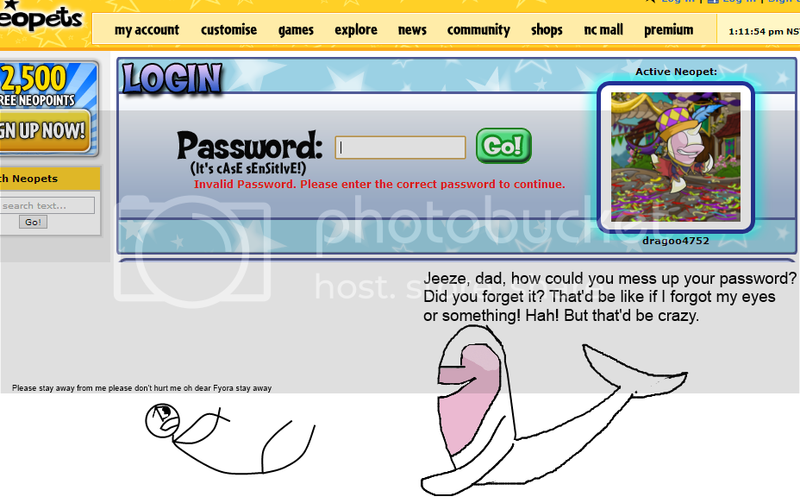 So, this picture was named (and captioned as) "Spongebob must be bad for you." In retrospect, that is both the more accurate and (considering the average age of users of this site) irrelevant assumption ever. Also, sweet serenading Santas! What font am I USING here? I can't read a word of it! Moral of this story, kids: If something doesn't come off as nerdy enough to you, add an unnecessary decimal. Suddenly, NERD CITY. Bam! Another potentially funny screenshot ruined by excessive commentary. It's just an average day for me. Seriously, that's like the name of the game with me! I just over-explain and over-explain everything, NEVER satisfied with how it is, just have to keep adding things over time and never, ever let a single joke just rest on its own, just constantly adding more and more nonsense to something until it just loses any humor it may have had when it started before I started writing a Dickens novel for it. Fortunately, this kind of problem doesn't ever occur in my captions, though. Clearly. 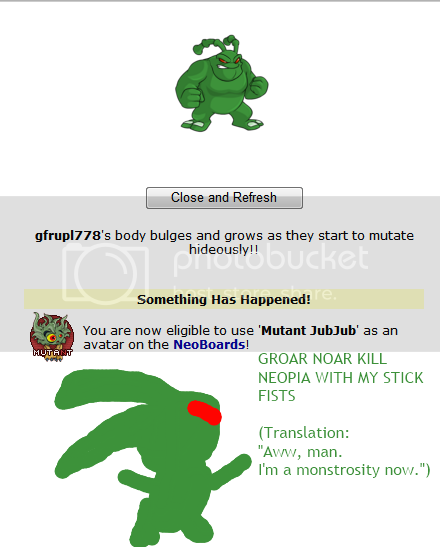 Awful Avatars are Attacking Acaras? AHH! So, this section varies between never updated and updated too often. Yeah. That's really all I got. It's SOMETIMES funny, I guess. Usually not. Yay, for things that don't make sense anymore! See, this was made when Icy Snowflakes were still worth like a lot. Like, a lot a lot. 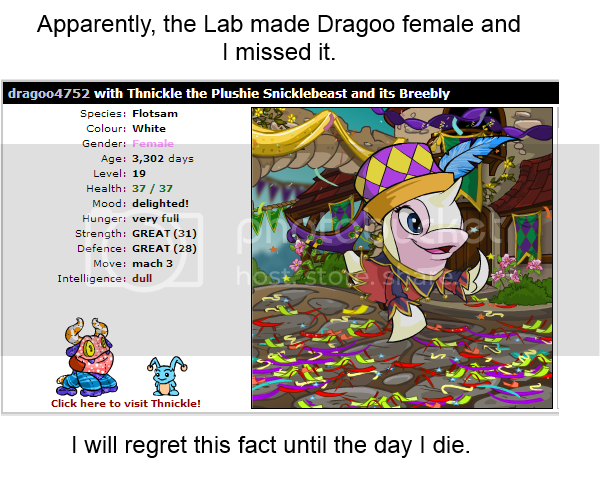 Oh, for additional "don't care", I think this was the first time I gave my pets legit personalities. Can you tell these are not posted with any level of chronology whatsoever? Also, Sweet Sardonically Singing Starlings! The Comic Sans just keeps coming back! But this time, it's in bold face! Abandon ship! 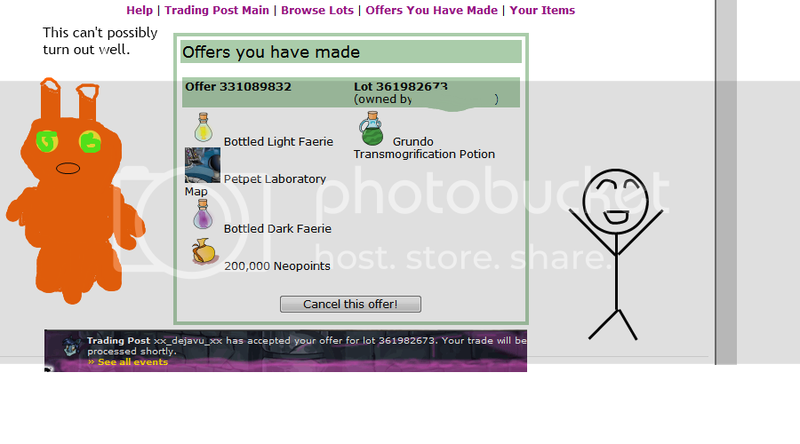 Huzzah, an expensive, lame avatar! Honestly, pink doesn't bother me, because I'm not a six year old boy, but this avatar is really kind of boring. It's only valued because it's expensive, not because of any level of interesting look to it. This actually used to be like my favorite avatar, back when I thought dark colors and being shady and junk was cool. I also hope that saying "Oh my God" and/or giving death threats in a screenie isn't a freezable offense, because boy howdy I do that here. Oh, and that guy who lent me the doll? Apparently he's frozen now, so don't know if the whole "bugging" thing is possible anyway! Wheee!. PAPYRUS RETURNS WITH A VENGEANCE. MY EYES. Which is a real shame, since dragoo's text (stupid, nonsense comment being ignored) looks pretty dang rad. I wish everything looked like that. Everything ever. Also, "awesomest". I'm just gonna let the stupidity speak for itself. 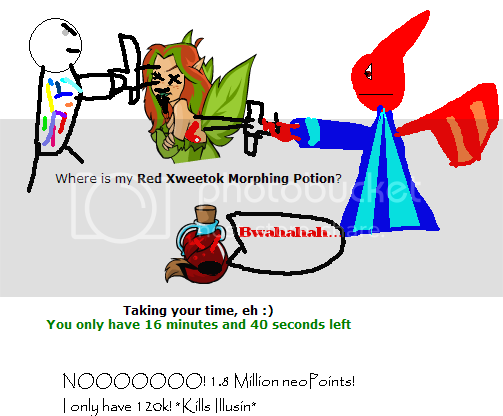 Well, actually, me-from-over-three-years-ago, it's clearly not worse than dung, as dung is only worth one neoPoint. Sheesh. Also, the shop wizard lookup is in a confusing place. What, you expected the quality to INCREASE over time? So, that font is pretty horrible, but I guess I can give it a pass, given the theme. That said, I don't even get the excuse of being young, since this is only about two years old, old enough that I knew not to use stupid fonts. 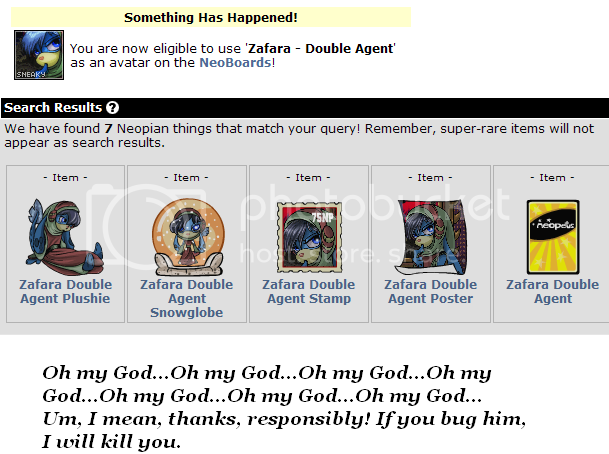 I'm not quite sure why I thought an avatar stand was a funny idea. Guess it could be worse. Despite everything I've said, I have to mention that the only thing this screenie does for me is make me really want to give that chair a high-five. 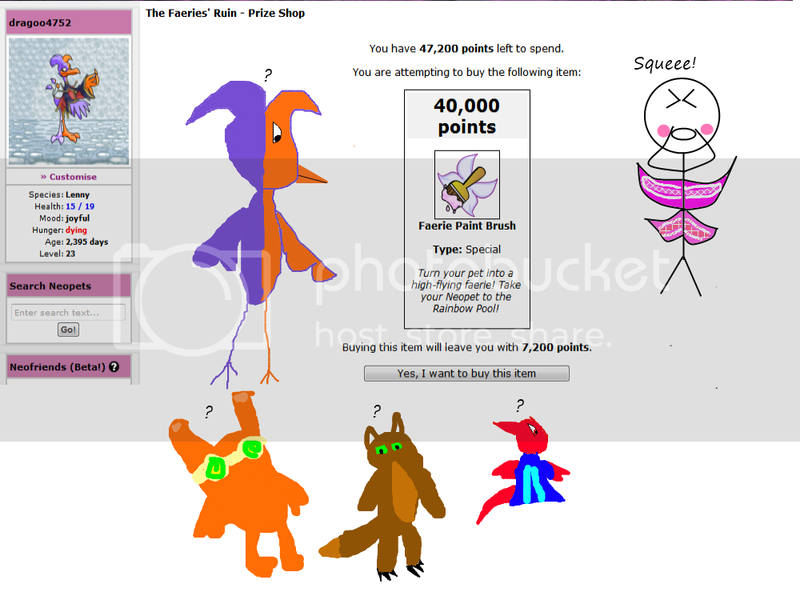 This took six-and-a-half years of general collection to get 700 unique items, a half hour of buying stuff from some random person's shop to get the other 300, and about three minutes to make this terrible picture. Yeah, that comment's lame, but you know what? It's only right to have a mediocre comment on this screenie. Because it's for Mediocrity! It makes perfect sense! That's my story and I'm sticking to it. Also, what is with me saying variants of "about time" a lot? It's almost as if I have nothing to say! But that clearly couldn't be it. 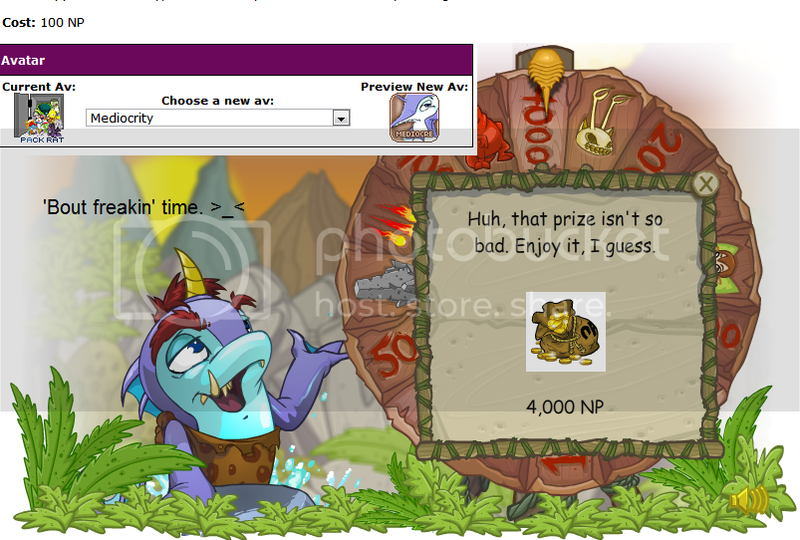 So, in my original comment for this, I said that this avatar was really easy to get...Despite admitting to using a cheat to acquire it. Yeesh. Next you'll see me brag about beating a game with an Action Replay. Also, oooh...oh dear. I said "Epic Win" in this picture, didn't I? Yeah, I'm really sorry about that...I promise, I won't do it again. You see how the other avatar there is ITTPD? I'm never showing the screenie for getting it. Ever. You can cry all you want, but you just won't see that screenie. I know you're gonna lose sleep over it, but I'm just that cruel. I took like ten minutes on that mouth alone and I still hate it. The eyes aren't horrible, albeit a little lopsided, and the arms are kind of awkward (he's SUPPOSED to have his arms crossed, but I don't that that shows). But the mouth? The ridges in that mouth fill me with an undying rage. So, uh, Gfrupl was otherwise not involved in all this, but he's really fun to draw. Other than that, I have little to riff on here. Other than lacking a joke, this is one of my less terrible screenies. 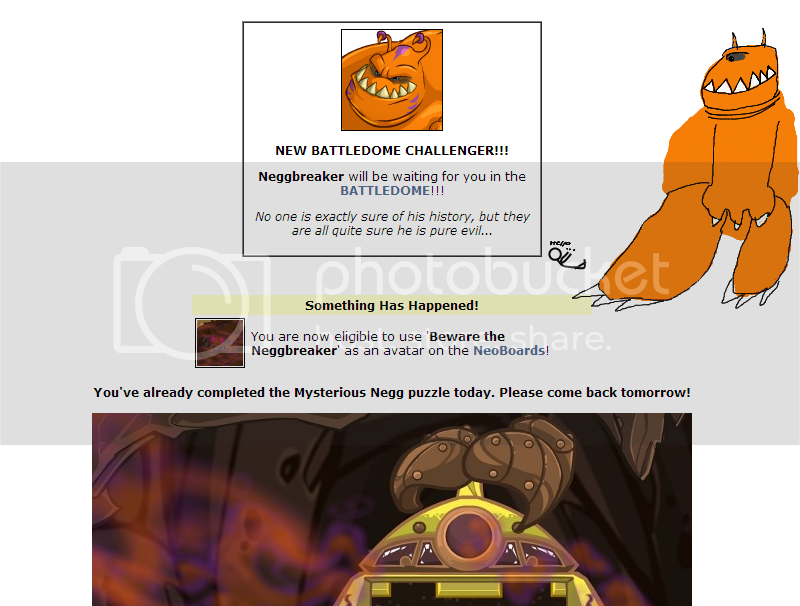 You're a...Neggbreaker! Dream maker! Love taker dontcha mess around with me! Sooo, uh, I have way too many screenies or something. As such, I move a lot of it to a second page. Because, as we all know, making more pages for people to go to makes it more convenient, not less. So, here's a bunch of other stuff. 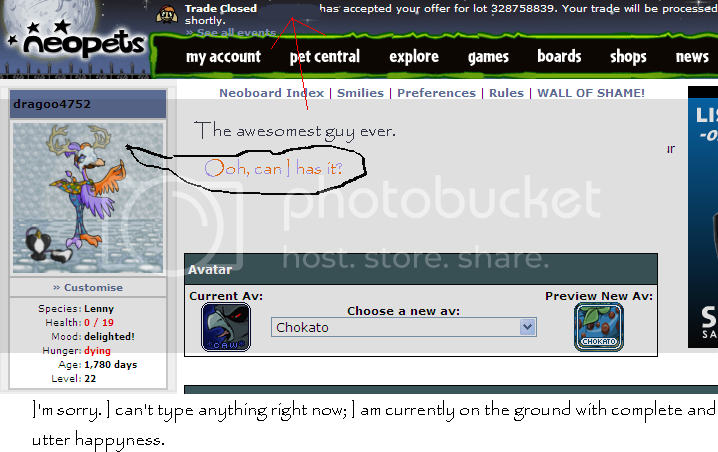 I have moved all of my awards and ratings to Dragoo's page. Go there, if you wish. Why in the world would you want to link to me? 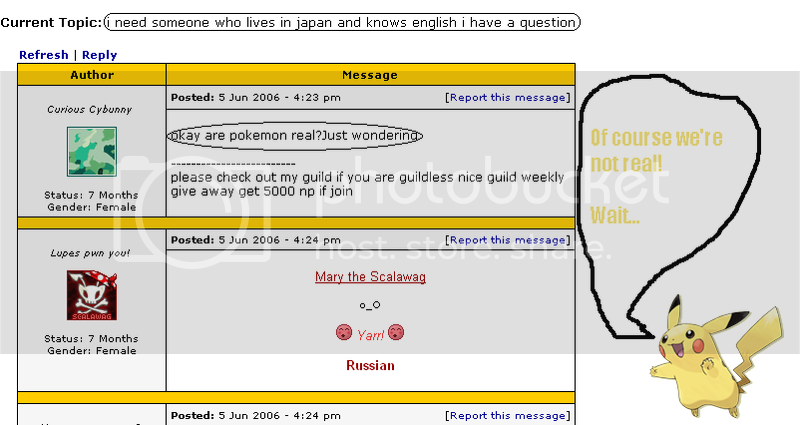 o_O You want to link to me? You sure? Why? Are you nuts? It's too dangerous! It may cause...bad things. I don't know. Whatever, go for it. Scroll down, see if I care. Whelp, that's about it. I guess I hope you liked them. Whether you did or didn't, I'd certainly like to know what you thought about them. If you hated them, feel free to criticize the junk outta me. I can take it. And, if you did like them, I update one in blue moon, so come back in about a year, and there might be one or two new ones. I go on a lot of hiatuses. You know, I say all this, and I know nobody's reading this. Who would? In fact, I doubt anyone else exists! This is all happening in my mind, with the world changing to my will! You are nothing but a part of my mind! Wahaha! But seriously, ignoring that solipsism, come back if you want. Don't make me beg. I'll do it. Why are you still here? 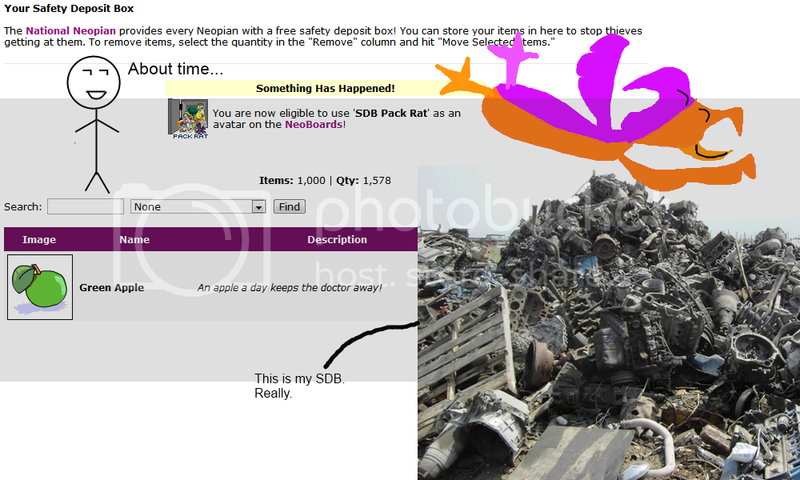 o_O Do you like scrolling down to the end of a screenie page? If so, you must be crazy; there's nothing else to see.